In the eighteen months since my last post on marriage, the Supreme Court ruled, by a 5-4 margin, that "gay marriage" is protected by the US Constitution. That decision, which up-ends 6000 years of traditional marriage, is putting many Christians in the awkward position of exercising their First Amendment rights to disobey the new "law" (court decisions are not really laws, but that's a topic for another day). 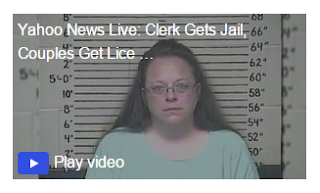 Case in point: Unless you've been living under a rock for the past week, you already know that Kim Davis, a county clerk in Kentucky, has been jailed for refusing a court order to hand out marriage licenses to gay couples. Asserting her strong Christian belief that marriage was instituted by God to be only between a man and a woman, she has refused any and all offers for a compromise. Guessing that a mere fine would not be enough incentive to comply, the judge chided her for not performing her sworn duties as an elected official and sent her to jail, indefinitely. The White House, lawyers, politicians, and "gay rights" activists have also said that her civic duty trumps her religious beliefs. They claim that no matter what, she must follow and uphold the law of the land and obey her superiors. But if the "I was just following orders" defense doesn't stand up, when it comes to committing atrocities, there must come a point where even this fallen world expects people to stand up against unjust laws and oppressive authorities. In fact, just last year, our country celebrated the 60th anniversary of the start of the Montgomery bus boycott, which started with a solitary, unassuming black woman, named Rosa Parks, who refused to follow the law and cede her seat to a white person. The trouble is that as long as God is kept out of the limelight, our society has only popular opinion to base its moral code on. And unfortunately, "gay rights" have really picked up steam, over the past 12 years or so, simply because a very vocal minority had the gall to stand up to the status quo. Christians must now learn from those successful tactics and do the same. When the decision was announced, "gay marriage" supporters, which had been protesting at the courthouse, shouted, "Love won! Love won!" Really? Did love really win? Does love send someone to jail for standing up for their Constitutionally protected rights? Does love rejoice at the suffering of others? Does love file lawsuits when things don't go their way? Does love go against God and His moral compass? People today have forgotten what love really is. They confuse it with lust. They confuse it with tolerance. They confuse it with greed. Isaiah was bewailing Israel's fall from God's good graces. Let us pray that we, as children of God and followers of Christ, can help turn this nation around, or at least point the right way to as many of His lost sheep as we can.